Upgrade to Xpa and then migrate to .NET at your own place, which can be spread out over a period of time. Hence, This NO RISK approach can help your organization reach its ultimate goal, migrating your Magic application and development team to the industry standard Microsoft.NET platform too. Best of all, this offer allows you to make a gradual transition to this new technology platform, so that your team has enough time to acclimate itself as your organization moves into the .NET world. A Special Offer for a Limited Time! (varies slightly depending on vendor). 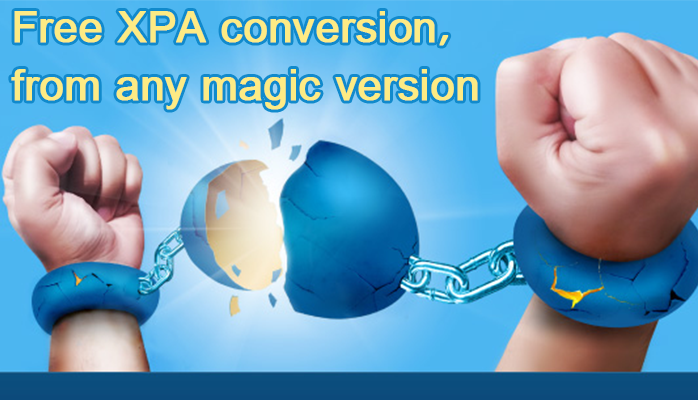 Offer Free Xpa upgrade with no obligation, and includes free integrated DB conversion. A unique alternative to Run-Time Licenses! Tool Fully Automated tool, whose results are delivered within 5 days. Largely manual, with delivery timetable TBD. Content Improve The Code, Combine Face-Lifting and Performance Improvements, Implement any new feature of Xpa. As-Is conversion. Method On-site work as needed. Remote project. Future Route The path that’s best for the client, including the option to escape from Magic. Handcuffed to Magic technology with no option to leave. Payment Zero risk. Try Before You Buy. Satisfaction guaranteed. Payment up front. Want to migrate your Magic Application to .NET? Visit https://goupte.com to learn more about our patented technology, and also Go .Net , our 100% automated tool for converting Magic applications to .NET.